I can't believe I am halfway through my 'shopping challenge'. 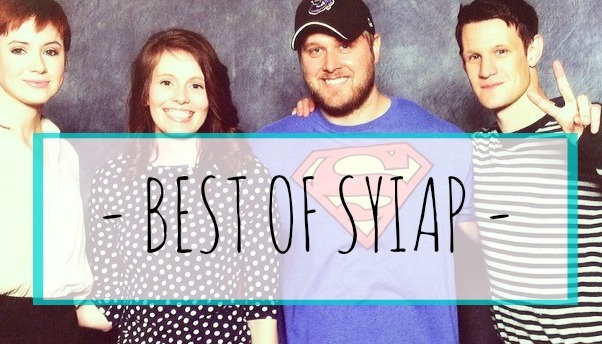 If you don't know what I am talking about, check it out here. Basically I wanted to go a year without buying any clothes, shoes, accessories, makeup... and I think that's it. However, I 'allowed' myself to shop with my mum, allowed myself to buy gifts and books, and anything that KC 'approved' was allowed. Those all might sound like cop outs, but I set those rules for myself knowing my issues were needless impulse clothing purchases, not books and not anything I spoke to KC about. Books - $16 - Still going strong with my library, but there was one book I wanted for ages and it went on sale for 99 cents, plus audible. Planner - I bought a 2017 planner which I was totally aware I would need to do. Shopping - $1 million dollars - this was the month of my trip with my mum. Okay, I don't know if I spent that much, but I do know I went crazy and I don't want to talk about it. But as soon as I got back, I behaved. Books - $15 - One last audible and then I cancelled it. Hoping for a sale next month. House - $1 million dollars - again, this is an approx amount. Lol jk. But seriously we bought SO much. New fridge, mantel, microwave, paint, stuff stuff stuff. But we sold our house, so you know. Books - $1 - another book I couldn't get any other way and it was on sale. I really wanted to sign back up with Audible but I didn't see the same sale they had last year (99 cents for 3 months), so... no. Sunglasses - $10 - mine broke. They were $5 when I bought them 2 years ago though, so I bought the exact same pair (but they had gone up to $10, rude). Curling Iron - $35 - new curling iron. Skincare - $100 - I spent about $100 on EVERYTHING because I had zero. Seriously. Nothing. Nada. One of my 30 before 30 goals is to get and stick with a skincare routine, and I can't do that without buying stuff. I got everything on sale though. I also got a new laptop, but it was basically my christmas present and KC made the decision with me. So there you have it - I've officially made it 6 months... Now, if you want to get all technical or compare against someone else's 'spending ban' or shopping challenge, I will have failed. But I have stuck with the parameters I set myself. 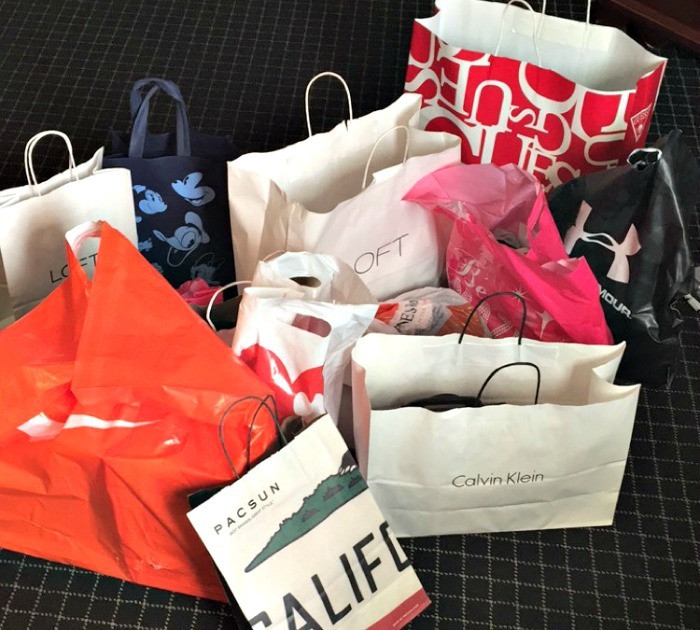 The whole point of this challenge was to stop mindless spending, especially with clothes and the like. OH BUT HERE'S SOME GOOD NEWS!!!!! One more card paid off! Can I get a high five? I'll high five myself I'm so pumped. So proud of you! Seriously no spending for a year is hard and I'd say you're doing awesome! FULLY SUPPORT you spending $ on the skin care. in fact, i don't even budget for that because skin care is an obvious NEED in life, amirite? I'm so proud of you and so inspired by you! Even if you did go a little crazy at some points, I think sometimes you just have to do that so that you don't go crazy, ya know? Like if you're so strict that you can't even enjoy that time with your mom, then to me that's kind of missing the point. I would love to do something like this, I can just never figure out a system that will realistically work for me. I'll be good for a while but then I'll go through a buy all the things phase (especially with running stuff). High five on your card, girl! and good for you! This is something I seriously need to try and keep track of. I think if I hold myself accountable in blog world, I'll actually stick with it. Because the same things you frivolously spend on are my problem areas as well. Target really just messes me up. Keeping tracking is most of the battle when it comes to cutting back! Nice work! I'm doing that with groceries this month. Yay for paying off cards! And I think you're doing great with your "ban". If you're minimizing what you would normally spend that's an improvement right? What kind of skin care do you use? I would love to hear about the products! Paying off a card is a huge win! I think you're smart to know what your limits are and work with in them. That's awesome!! It's such a great feeling making that last payment ... so I've heard. :) One of these days, I'll be there. And your challenge worked because you gave yourself some leeway. I think it's harder and definitely downright impossible to succeed if it's an absolute ban on any shopping whatsoever. Way to go!! HIGH FIVE! Paying off another card is awesome! And I have to think you're only going to gain more momentum now that the house is sold! Your goal wasn't to spend $0. If it was, sure, you would have "failed". But it wasn't. You did exactly what you set out to do. Just have to keep on going! Spending less money is ALWAYS a success in my book. I think you're doing amazing! And, I think I've said this before, it's great that you've given yourself parameters to work within. Going cold turkey will help in the short term but, once the ban is over, you'll binge and all that. It's more about changing the behavior, which you're doing. And congrats on paying off another card!!! Good work paying off that card! That's proof of your progress right there. And I think cutting back for a year has much more of an impact than one month off. Keep it up! I think you're doing really well, keep going! ugh the house stuff, I hear you. I don't even want to acknowledge how much I spent since we moved in in May and I STILL feel like I could go get more things. Me! The minimalist! Home owning is expensive. High Five on paying off a card! Way to go! You are doing really good. I think I need to do this challenge as well! Hmm..I think I will start off small and do at least a week. ahha. I so have a shopping problem and I feel with the holidays, I'm getting out of control. One gift for you, two gifts for me...so bad!! Congrats on the credit card! That's huge! I think all your spending is totally justified and falls within your original guidelines but I am a shopping enabler so don't listen to me. I finally listed some stuff on eBay, only about 9 months after I said I would. Ha. Better late than never I guess! And I did a similar thing with the subscription box I get that I love - I can't reeeeally justify £15 a month and I saw an offer for a free month so cancelled so I could re-sign up but the offer had expired already. So... I just didn't resign. I'm quite sad but I think it needed to happen! That's great you paid off another card! That's a big deal and I think your spending is totally realistic. It's not realistic to spend money on absolutely nothing for months at a time. I'm starting to get a little stricter about my spending. I've cancelled reoccurring charges like Pandora radio and I'm not going to reload my Starbucks card every week either. I need to also get better about bringing lunch with me to work instead of buying lunch and snacks. Woohoo girl! Even though it may seem like you overspent compared to others, you stuck within your parameters, which is all that matters! Plus the house is a huge purchase, but you sold the old one so yay! LOL at your estimates of one million dollars. Shopping with your mum/on vacation totally doesn't count- especially since you planned on it, and it's part of the experience! You've done an awesome job so far & yay for a new computer & for paying off one of your cards already! 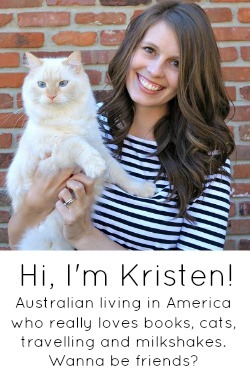 Woo-hoo, Kristen! Congratulations on paying off another credit card - that's huge! And good job overall with your shopping ban. You met your parameters and that's what counts. What I do want to know - is how the heck did you fit all your LA shopping into your suitcases? You are a good suitcase packer, which I am not, so I would have had to buy another suitcase and pay a fee for adding a bag. So impressive! And yay for paying off a credit card annnnd selling your house!! I definitely need to slow down my spending, particularly on clothes. I feel like I have enough now, and stuff coming for Christmas. Now I want to buy house stuff and other things! Way to go on getting one more card paid off, that's fantastic! And I think that you've done a great job with your shopping challenge. I've found that Chris and I have been spending like crazy lately, so we've tried to make it a thing that we ask each other if we can buy something before we actually do. It helps with the mindlessly buying things, like you said. One more card paid off! Well done, girl!! Also, I want to hear what skin care products you landed on and what you think of them! I am so impressed with all the non-shopping you have been doing! We have been spending so much lately for gifts for family and friends (which also means buying things for yourself along the way because SALES. Haha), so I definitely want to do a few no-spend months at the beginning of the year. Congrats for paying off a card! Nice! Between you and Mattie I'm determined to set a budget for next year, haha! And yes to paying off a card. That feel SO GOOD. Ha!! YAY for paying a card off! That is amazing!! Woah this is impressive! I'm currently trying to do a no-spend WEEK and that's hard enough ;). Wow great job paying off the card! That's massive!! We all have unique needs and different things we identify within ourselves as bad habits, and you were brave enough at all to attempt this shopping ban with your parameters so good for you! You know I'm super proud of you and HUGE CONGRATS for paying off that card! Way to go, halfway through wooo! Paying off a credit card is the best feeling in the whole world!!! You're so awesome for keeping to your parameters!! Hey, just a small comment from a silent reader... Did you hear about minimalism and the Konmari method? Of. You want, just google it. It is about sorting and decluttering all the stuff you have at home and to enjoy a simplified life. I was amazed how much stuff I could donate that someone else might need more than myself and I saved a lot of money. (no, I am not an advertiser, I just thought you might find that interesting :)). thank you Susanne! i have definitely read that book and it helped me get rid of a lot of things i was holding on to (like a dress i bought 8 years ago that barely fit then, let alone now) but i'm still not 100% on board with the minimalism. more like minimalish ;) but we recently moved and i got rid of a LOT of stuff because it was easier than packing haha. Get it, girl! I think you're crushing this. I wouldn't even count the stuff you bought for your old house - that's all part of selling the house (see, I'm helping you out! :) ). And high five for another card paid! You did awesome these past months! I don't think anyone would say otherwise. You set your own rules, and you stuck to them. That's huge and quite the accomplishment! And HUGE high-5 for another card paid off!! High five on paying off another card! Congrats on paying off the card! You did awesome the last 6 months (I can't believe it's been 6 months already??)!! Well look at you! Super impressive friend! I try to generally not spend a lot either, unless I really need it. Seriously, I get buyers remorse sometimes over buying mascara, or a pair of plain black Target flats because my old ones had a HOLE in them. I'm ridiculous. Go you! I think you've done a great job! This is really awesome! Super proud of you for even keeping tabs on this stuff. I am going to try and start doing this come January but I have to wait until then because December is a mess of spending/taxes/insurance renewal/holiday and of course my own birthday so yeah...January is the start date! YAY! Lol at the Million Dollars--that was me this month, dang Black Fri and Cyber Monday. Back on track...next month! Dang girl this is so impressive! We are big time saving for a house so this is a challenge I really need to start! Girl you are doing awesome!!! I'm thinking about doing a no buy January because of the insane amount of money we are spending with the holidays right now - ugh. Congrats on getting rid of another card! Girl, you hace been doing SO good! Way to go for paying off another card! Way to go girl! I think you've done fabulous! Teach me your ways! I'm hoping to start fresh for 2017 and really buckle down! Yay for a new laptop and skincare products! What line did you go with? This is AWESOME. I really think I need to do this for 2017...I'm so out of control with shopping. While I don't eat my emotions, I shop them. Will you be my wingwoman? Teach me your ways!! Girl you are amazing. Other than the shopping spree with your mom (which is totally justified) I think you did really well only spending on the basics like books and well if you need a new laptop, then that's justified too because how are you supposed to blog?! Hope you had a fab weekend! This is a great idea! I'm actually not a big shopper but I know it can get out of hand sometimes, haha. Half way there - good for you! Girl, this is awesome! I am so behind on all my blogging friends but I'm so proud of you! You are doing a great job! Congrats on paying off the card!! You did great on your shopping goal. We had the same thing with some unavoidable spending. We spent a bunch of money upgrading a couple furniture pieces before baby got here. I count that as necessary spending. You did really good on books. I'm still slowly going through my few NetGalley books. 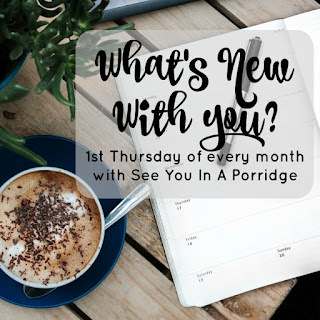 Maybe next month I can come back to the book linkup (I hooope). I also have to figure out how to borrow ebooks from my library, that will save lots of money. I'm not sure I could go that long without buying anything! Although that being said, I do go months without shopping here because I find it to be an awful experience. But now I have begun to understand why people love online shopping. Oops. Well done, girl!! You rock!! 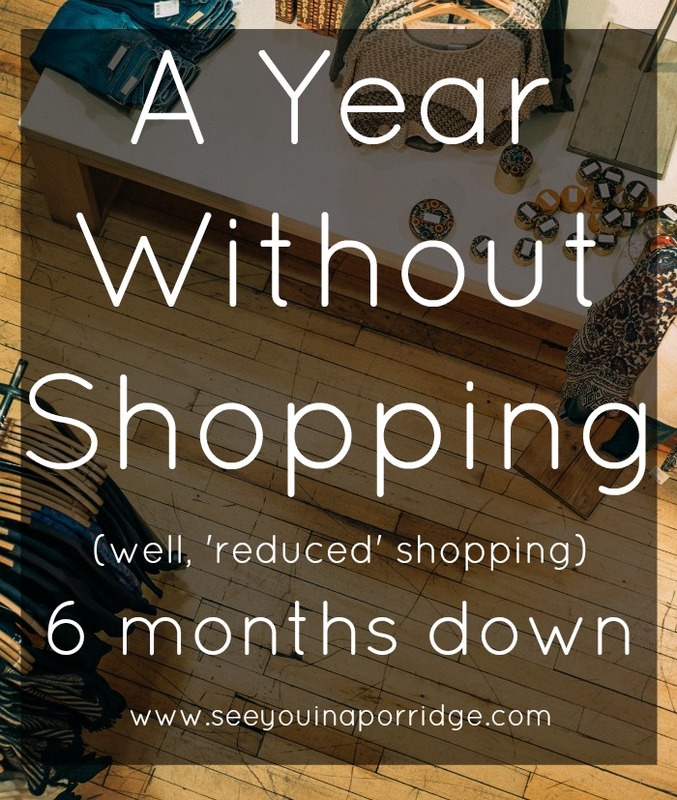 If I had your parameters I could totally do a "no shopping" year! ;) I don't buy much of anything besides diapers. I'm just not a shopper. But I do get envious of other's amazing outfits so maybe I need to get down with shopping... Haha!